This is Wally Berg reporting from Base Camp. The main excitement here today has been the arrival of our climbers to their spectacular camp on a big snow ledge at 23,700 feet (7220m) high on the Lhotse Face. As I have been on the radio and sat phone today, I have been impressed with how closely we can all stay in touch and also in what varied places we are all are. 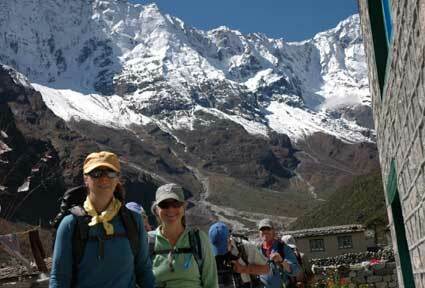 I spoke with Leila and Karen from the first trekking group today. They are back in Kathmandu. I am sure that the trekking members are enjoying the showers at the Yak and Yeti over and over and also that they must be sad as they prepare for their farewell dinner tonight before leaving Nepal tomorrow. Just now I got a radio call from Ang Temba and the second trekking group, Sally, Chuck, Linda, Wendy and Catherine. They are all at Eco Lodge in Lobuche, already at 16,100 feet (4910m) and getting closer to base camp by the step now. 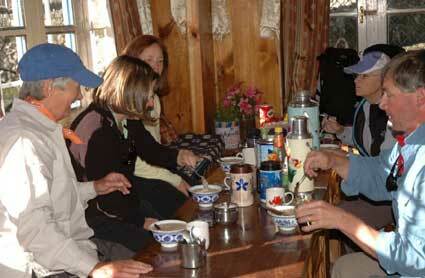 Ang Temba told me the group was settling down to afternoon popcorn and tea and checking out their rooms. I was happy to hear that they are traveling with a friend, Margret, one of the two physicians from the Himalayan Rescue Association clinic in Pheriche. 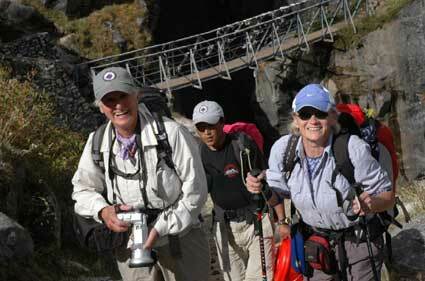 The first trekking group had the pleasure of trekking with Anne, Margret’s partner for the season at the HRA clinic. 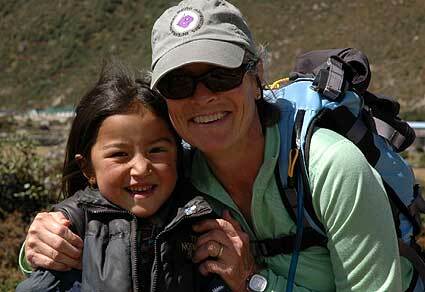 We were pleased to know that Margret will be arriving at Base Camp with the group day after tomorrow. Ang Temba told me the entire group is doing well. Yesterday from Pheriche they walked to about 15,000 feet (4570m) on the ridge above Dingboche. When they got back from the hike the hot showers at the Himalayan Hotel were most welcomed! Today after lunch the group walked past the memorials above Thukla and on into Lobuche in nice weather and beautiful light.